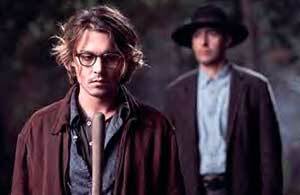 Secret Window is based on a novella by prolific horror scribbler Stephen King, which straightaway gives you some clue as to what you're in for: something scary, suspenseful, or at the very least, unexpected. 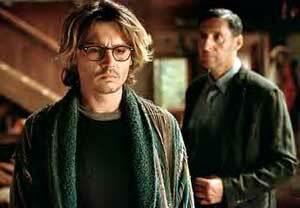 And Secret Window? Well, it kinda falls somewhere in between. 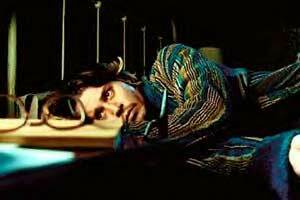 The story is satisfactorily macabre (I always love it when a Hollywood ending is denied) but not as gripping or tense as it could be, and were it not for the presence of the divine Mr Depp, I probably wouldn't have bothered going to see it at the cinema at all. 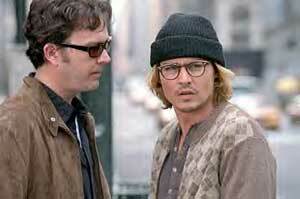 Johnny, however, carries the film with a grace, humour and charisma that makes the whole thing well worthwhile. He plays Morton Rainey, a lazy writer who's retired to a secluded lakeside holiday home, supposedly to write (not that you ever see him write a thing) and get over his messy divorce. Now ladies, if you like Johnny down and dirty (okay, looking a state - we're talking Captain Jack and Dead Man's William Blake rather than Ichabod Crane) then you are in for a treat because he looks beautifully dishevelled. Like Dean Corso's scruffy younger brother, he's patchily shaved, with dirty blond hair that should merit its own dressing room, as it seems to do as much acting as he does, sticking up at all angles like Edward Scissorhands' before smoothing itself down into a sinister bob at the end. Mort seems to spend most of his time napping on the sofa (waking up to find his hair even more unkempt and wild), eating Doritos (sponsorship deal? Everyone in the film seems to keep a share-size bag to hand), trying not to smoke and spending precisely zero time in front of his computer. One day, he is woken from one of his naps by a stranger at his door, played by the fantastically deadpan John Turturro. The stranger, a dour Mississippi man called John Shooter, who wears a black preacherman's hat and probably has a box of snakes in the back of his truck, claims that Mort has stolen his story, and brings along a copy to prove it. Next thing Mort knows, his dog is dead, his ex-wife's house has been burnt down and the private detective he sets on Shooter turns up dead (that's the second time I've seen poor Charles S Dutton hacked to bits in a month - he really should learn to steer clear of axe-wielding maniacs). But why is Shooter so intent on destroying his life, and what can Mort do to get rid of him? <DEFINITE SPOILER>Yes, you guessed it, Shooter doesn't actually exist, Mort has made him up. Traumatised by his wife's infidelity (he finds her in bed with another man, the ultra-annoying Ted, whom she now lives with) and fuelled by Jack Daniels (natch), his mind has literally split in two, and the result is a crazy Southern preacher out for vengeance. Er, yeah. My verdict? A one-man show that's a real treat if you're a Depp fan but probably not that riveting otherwise. 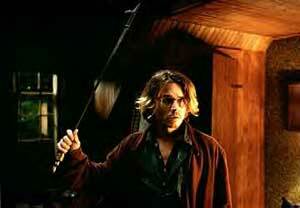 Still, it's definitely better than Gothika.